Give yourself a treat without feeling guilty. 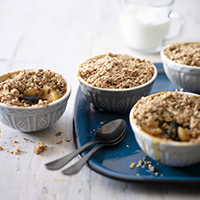 This hearty crumble has 2 of your 5 a day and is a source of fibre, needed for a healthy digestive system. 1. Preheat the oven to 180oC, gas mark 4. Cook the fruit and prunes in a frying pan with the orange juice for 3–4 minutes, covered, then transfer to 4–6 individual ovenproof dishes. 2. Meanwhile, rub the butter into the flour and sugar until it makes a coarse crumb-like texture, then stir in the oats and cinnamon. Sprinkle over the fruit and bake the individual crumbles for 20–25 minutes until golden.